Stuart Lancaster calls them “something from nothing players” – those who can conjure a spark and create a try-scoring opportunity with little to work with. Christian Wade is arguably the best example available to England. Cast your mind back to his pair of outrageous finishes against Gloucester last season. Searing pace and scintillating footwork beat a plethora of would-be tacklers and gave him a brace of tries from relatively innocuous positions. Danny Cipriani possesses similar game-breaking ability, although guile and vision tend to be his weapons of choice as much as raw athleticism. It was refreshing to see him selected to go on England’s tour to New Zealand this summer and in three appearances – two cameos as a replacement in the first and third Tests, plus an assured outing against the Crusaders – he posed plenty of problems for the opposition. Prior to the series, Gregor Paul of the New Zealand Herald branded Cipriani a “catastrophic dud” – a lazy, sensationalist evaluation based on an inconsistent spell in the Super 15 with the Melbourne Rebels rather than anything the mercurial 26 year-old has produced since joining Sale Sharks with renewed desire and focus. On Saturday in the Aviva Premiership against Gloucester, Cipriani brilliantly manufactured three scores in the opening 40 minutes. Then, much later in the contest, he scythed through to land his side’s fourth for good measure. Sale were beaten 32-27, but that is perhaps an even bigger indicator of Cipriani’s performance. He was largely on the back foot as his pack were out-muscled. These video clips and screenshots demonstrate how his instinctive attacking excellence caused havoc. First, here is Sale’s opening try, scored by full back Tom Arscott with just two minutes on the clock. Start the clip at 0:27. The key here is how long Cipriani holds the ball before dropping onto his left boot. On taking the pass from scrum half Chris Cusiter, he is fairly deep – certainly not engaging the Gloucester defence as a running threat. 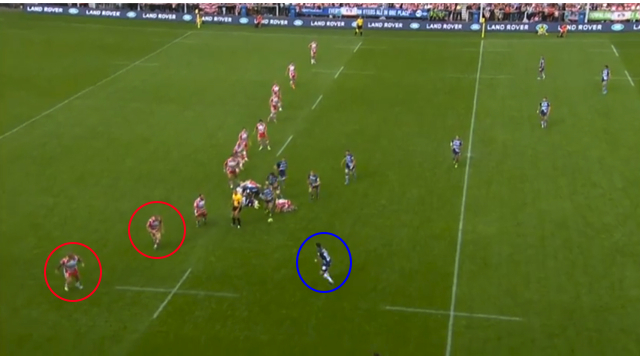 However, as the below screenshot shows Cipriani (blue circle) identifies a mismatch and does pose a threat on the run. Richard Hibbard and Jams Hudson (red circles) are isolated on the blindside. Cipriani knows he has the pace to worry them, and carries 10 metres to test the water. Wary of creating a dog-leg, caught out for pace and perhaps still learning to play together – both are new signings, remember – neither Hibbard nor Hudson press forward to take the space in front of Cipriani, who has added to the uncertainty by carrying the ball in two hands. Given Sale’s possession has come from turnover ball at the lineout, Gloucester full-back Rob Cook is caught a long way out of position. That makes wing Charlie Sharples a crucial figure. However, as the red arrow shows, his shoulders become turned in towards Cipriani because he does not trust those inside him. Although very quick, he cannot turn in time to intercept the perfectly-weighted grubber. Body language was a significant factor in Cipriani’s next assist too. Pause the clip at 0:42. This was the most spectacular score of the entire game, but it can be broken down into a blend of decision-making, awareness and sound technique. For a start, look at the ruck prior to Cipriani’s chip. Sale have taken a quick lineout, and are attacking from deep. Firstly, the speed of the breakdown disorientates Gloucester. As the ball comes back, Sale have options on the blind-side (circled in white) that must be looked after. Therefore, scrum half Greig Laidlaw (red circle) steps into the line where he might normally sweep in behind. Cipriani notices as much, and aims his dink into the space indicated by the blue rectangle. After gathering one-handed, Cipriani brings the ball back into two so that all his options are open – the first lesson any youngster is taught as a junior player. This shot shows that perfectly, capturing the moment eventual scorer Cusiter hits a support line, communicating accordingly. Here is a better illustration of the effect Cipriani’s movement has on Gloucester’s scrambling defenders. Both James Hook and Jonny May are attracted to him and have ignored Cusiter’s cutting line across. Henry Trinder (on the right) has noticed and is pointing at Hook telling him to pick up the Scotsman, but it is too late. All of this came from a calculated risk, and Cipriani took another for his third assist. Pause the next clip at 0:59. Once more, we have a very clinical movement. In the modern game, so many tries are scored from a swift transition between attack and defence. On this occasion, right wing Jonny May is penalised for getting up after being tackled and held on the floor. As referee Greg Garner makes the call, Cipriani is already looking for the ball, knowing May will be out of position. A shot of him setting off, with May circled in red and out of the game, already hints at how good his decision is. Given Gloucester’s right wing cannot recover, Sale have a fantastic opportunity on the counter. Though Billy Twelvetrees’ tap-tackle fells Cipriani, Trinder is committed and a flat offload sets Tom Brady clear. Full back Luke McLean follows up and Sale are in again thanks to some quick thinking and razor sharp spatial awareness. McLean’s try gave his team a 17-3 advantage. Even so, by the time Cipriani went over himself for a bonus-point effort 40 minutes later, the hosts had wrestled back the lead. Still, it is worth taking a look at yet more incisive option-taking. From this first screenshot, we see referee Garner holding out his arm for advantage to Sale just prior to Cipriani receiving the ball. The possession is a ‘shot to nothing’. Notice also that replacement loosehead Yann Thomas is dawdling back into the defensive line to present a classic mismatch. Both of these things present an inviting target. As Cipriani collects and steps off his left foot, you can see that Thomas has over-chased. The gap between him and Twelvetrees in the guard position is huge and he is flat-footed anyway. From here, the rest is relatively easy for a balanced, pacey runner. A try was the very least Cipriani deserved for his sterling afternoon. With Freddie Burns, Stephen Myler and George Ford starting the Premiership season in eye-catching form and Owen Farrell also looking comfortable on his return from a knee injury, England’s cupboard is well stocked at fly half. All of those contenders have respective strengths and each one is improving all the time. But in terms of off-the-cuff attack, Cipriani stands out. Deep down, Lancaster probably knows that. At the heart of Bath’s victory over Saracens was the immense Dave Attwood. He presented an awkward obstacle to Saracens’ progress all night. It was the kind of brawny, bristling display that makes Graham Rowntree grin. These clips demonstrate how he helped blunt the Saracens battering ram.